Recently we celebrated our 40th year of independence with much pride and joy. It is true, as writer Zafar Iqbal says that after all these years of political bickering and divisions it is nothing short of a miracle that we still have a post-war generation who are patriotic rather than despondent, although it might have been justified to tilt towards the latter. However before this superficial analysis leads us to a comfy zone of a job well done, we ought to reflect on the rise of a new generation of 'ultra-nationalists': a generation who claim to be patriotic but given their mindset and mental psyche can be every bit dangerous to our future as other forms of extremists. While browsing through the internet, I came across a webpage that contains Photo-Archives portraying Bangladesh's history. The pictures mostly relate to our war of Independence; the diversity of the images truly captures our heroic struggle for freedom. The initiative itself is commendable and is much needed. However, certain comments with respect to the war-related pictures can leave people bewildered. Given the subject matter, the administrator of the website has done a good job and it there fore was not surprising to witness the presence of some disturbing pictures related to the war. 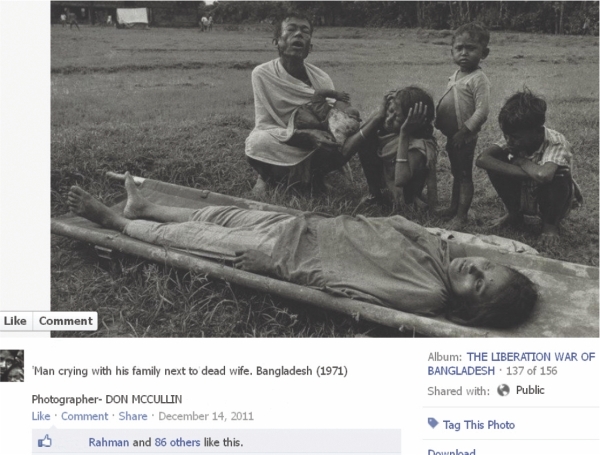 For instance there is a picture where suspected ‘Razakars’ are seen to be bayoneted, while in another there is a picture of a decomposing dead body of a suspected Bangladeshi collaborator lying on a rail line. The pictures drew plethora of comments from sheer glee and jubilation to criticism regarding killings without trial but in all honesty the views for the latter was like a drop in an otherwise ocean of misguided public display of patriotism. It is difficult to understand how a human being can jump with joy at the sight of a dead body whose crime, at least from the pictures and the caption, remains unknown or at best conjectural. Some, obviously with more brawn than intellect, attacked the critical remarks by questioning the users' patriotism, rather than focusing on what they were saying. Things like these do happen in wars but one sees no point in jumping with joy at these sights 40 years later. To find such pictures disturbing will not make us unpatriotic nor will it make us lose respect for our freedom fighters; if anything at all it will make us a little more human. Many challenged the criticism by saying that these people were Janoars or animals and deserved to be punished. This is precisely the argument Hitler used against the Slavs and Jews or Pol Pot against the intelligentsia. Others argued that one cannot feel the anguish of the actual people who suffered at the hand of these Janoars. While such an argument may be rational it can also be the reason as to why we should be more objective. It is logically absurd to compromise ourselves and become less rational in order to be more objective! Before I am misunderstood, let me reiterate; I am not questioning whether it was justified to torture or kill such people without only trials, this discussion I think is pedantic at best. What I am more concerned about is the mindset of a particular group of the present generation, whose close family members did not die or who were not affected by the war as such, but are yet excited by the scene of such deaths; such behaviour is abnormal and by no means isolated. For these are signs of impressionable malleable minds; those who can be moulded in to believing pretty much anything. They are the unwitting cannon fodders who can be used for any political stratagem or are already being used. They are the ones who will blindly believe in ideologies and can go about burning buses without remorse and stop others from rescuing an innocent passenger from burning to death. If these people were indeed humanists then there should have been an equal outcry against the injustice around the world in Somolia, Darfur, etc. For these too do not affect us directly but are nonetheless nothing short of a human catastrophe; but do they? It makes them either pretentious or part of a directionless and thoughtless herd, and neither of these prospects look appealing. The greatest source of fear lies in the fact that a large section of these individuals are part of the educated mass. It is as if in fear of looking unpatriotic or their overzealousness to look patriotic, they have simply relinquished their principles and faculty of reason. If all it takes us to 'like' a gruesome picture of a murdered person is a caption stating that the person was a 'suspected' Pakistani collaborator who potentially committed something, then shouldn't we be surprised by senseless 'gono pituni' or ‘mob brutality” that we see in the newspapers? Little less heart and little more intellect might help this country more.